The company which employed two workmen who were electrocuted in County Durham has been cleared of any blame. Fred Cook, 38, and John Crimmins, 33, both of North Shields, were killed when their tower light hit an overhead power cable carrying 20,000 volts in 2002. Their employer Newcastle-based Hatton Traffic Management was found not guilty of two breaches after a trial brought by the Health and Safety Executive. 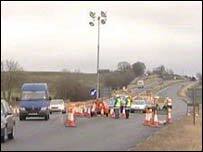 An inquest into the deaths in 2003 returned a verdict of accidental death. During the trial, which concluded on Wednesday, the jury at Teesside Crown Court were told Colas of Crawley, West Sussex - the major contractor for the Highways Agency - had admitted a breach of duty of care. The case against Colas will be heard at a later date. An inquest into the deaths heard how the ground was sparking and small fires were alight when the two workers were discovered at the base of the tower. The tragedy happened during roadworks on the A66, near Bowes, in County Durham, when the pair were asked to move the metal column.